1. No flash, no ultraviolet light, good for eyes. 2. Safe to use. 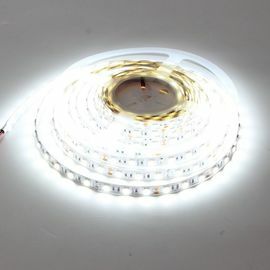 DC12V Super bright White SMD 3528 LED strip light. 3. The working voltage is 12V, extremely low heat, it is touchable and safe to children. 4. Total watts: 15.6 watts / Roll, 183 PCS LED lights per reel. 5. Easy installation. The strip lights come with double faced adhesive tape which can fix the strip well. 6. White ultra bright LED. 8. Waterproof design, perfect for either indoor or outdoor use. But make sure not to put it under the water. 9. Very suitable for both lighting and decor. Such as kitchen, under cabinet, dining room, bedroom, garden, patio, balcony, etc. 1. Emergency & security lighting, advertisement sign lighting. 2. Decorative lights for holiday, event, garden, show exhibition. 3. Widely used for home decoration use, hotels, clubs, shopping malls. 4. Architectural decorative lighting, boutique atmosphere lighting. 5. Extensively applied in Backlighting, concealed lighting, channel letter lighting.